Happy Father’s Day to all those awesome daddies out there! Nothing says I love you like bulk sausage. These “brownies” are a favorite of my husbands and he requested them for his first Father’s Day breakfast. 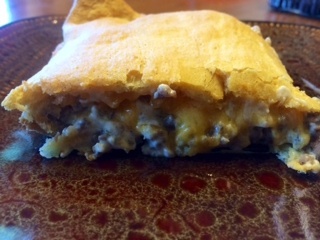 Who can say no to a layer of cheesy, creamy sausage mixture sandwiched between a golden crescent roll crust. My rule of thumb with cooking is that if the recipe include cream cheese its a keeper. These little buggers are to die for and to top it off are SUPER easy to make. There are only FOUR ingredients and you’ll be in hog heaven in less than an hour. Now the recipe says that it can serve 32 and I seriously just laughed out loud. I could probably eat a pan myself those silly fools. Now these sausage squares are not necessarily a healthy food item but it’s Father’s Day so make a batch and watch your favorite dad gobble them down! Step 2: Unroll 1 can of dough and place in ungreased 13X9-inch pyrex dish; press over bottom and 1/2 inch up sides to form crust. Step 3: Cook sausage over medium heat in skillet until no longer pink. Discard drippings and add cream cheese to skillet. Cook over low heat until melted. 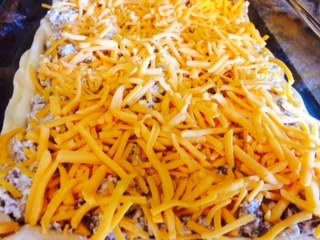 Spoon evenly over crust in baking dish and sprinkle with cheese. Step 5: Bake 21 to 26 minutes or until golden brown. Cool 10-15 minutes and nom on daddio!